My craft fair is this Saturday! Eek! 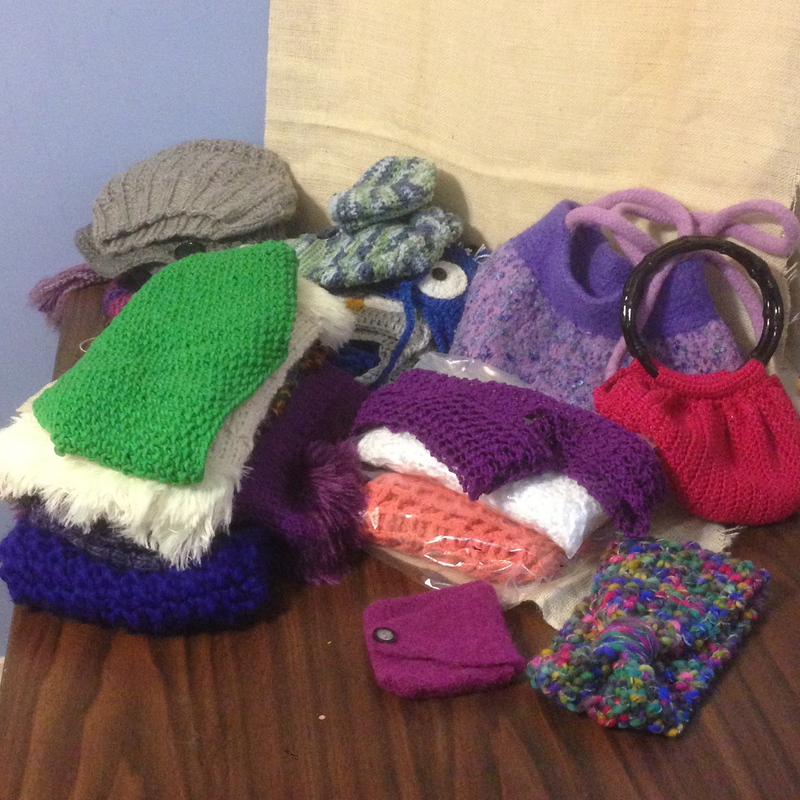 I’ve been so busy getting ready—I think I’ve made at least ten new hats in the last two weeks. I went through my for-sale items and pulled out a couple of older pieces I’m not as proud of anymore, and I pulled out all the things I’ve made since my last craft show, i.e. all the things that need tagged and priced. It was a bit daunting. Since I took that photo, though, I’ve gone through and tagged almost half of it. Of course, I’ve also made two earwarmers , a pair of bootcuffs and worked on a hat order. Like I said, I’ve been busy. And yesterday, a couple of flowers I ordered from Junie Balloonie arrived, and they got added to my bags. I love them! 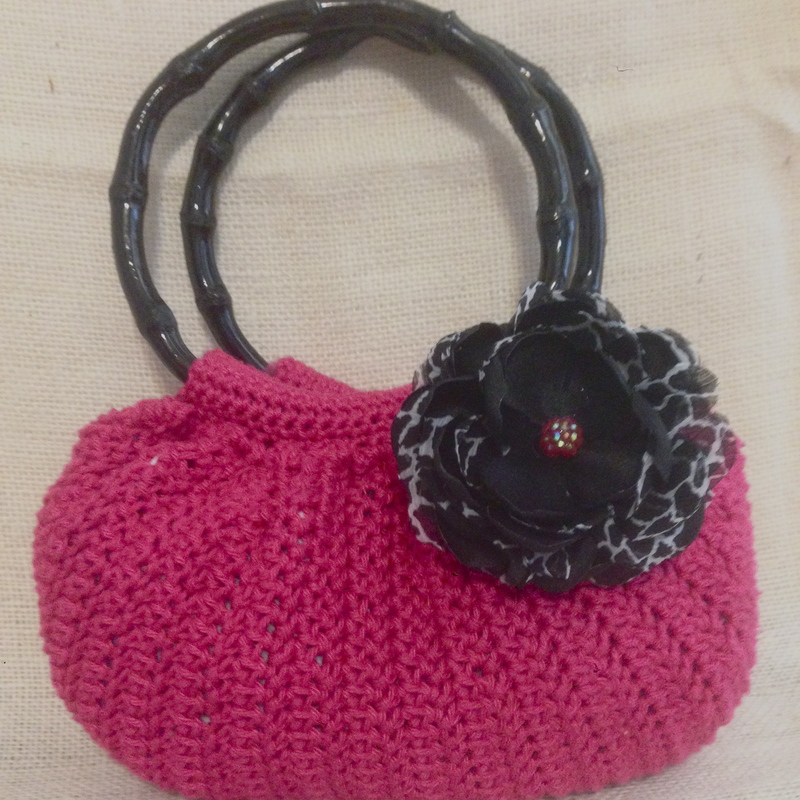 Speaking of flowers, I also knitted a new one yesterday. The craft fair asked for a donation, so I’m donating a purple and green beanie made with some gorgeous sparkly Berroco Brio. It should make some girl happy. It was originally unadorned, but since it was going to be a focus item, I decided it needed a bit of flair. And quick! 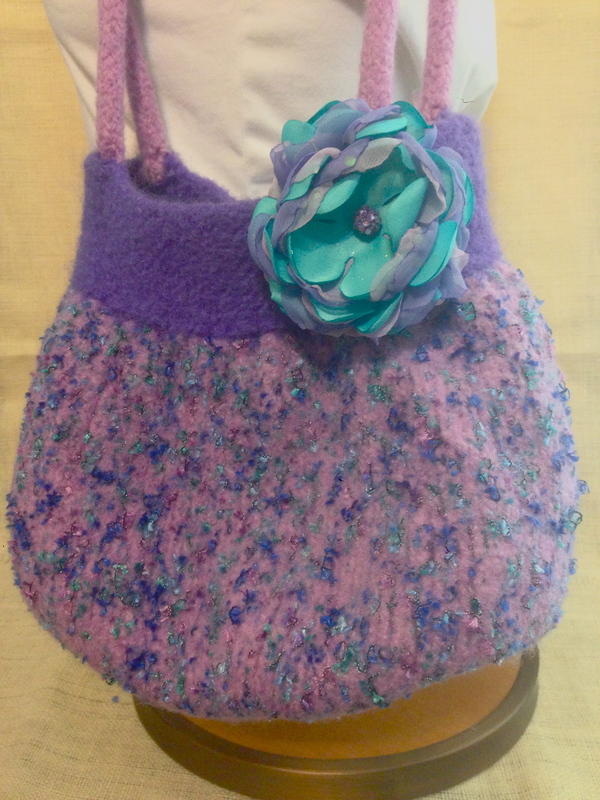 Thank to the Rose Pin pattern, I had a little dusky-purple flower to sew to the hat. I like it. Today I needed a break. I needed to do something I wanted to do, not something I thought would sell, not something that was an order or a suggestion. I needed to make something that came completely from me. Of course that means a trip to the LYS, right? I came home with some rainbow Mochi plus, and it’s going to be a simple beanie with a ribbed edge. 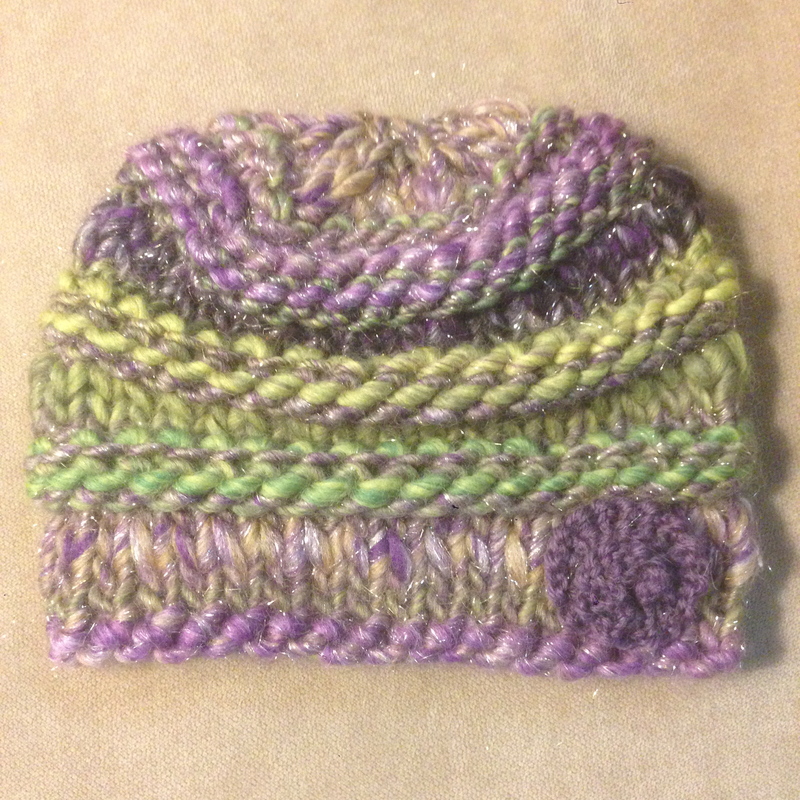 I love rainbow yarn, hats, ribbing, and working in the round, so this project pleases me. And I even learned a new cast on for it: the German Twisted. It’s so simple and fun; I can’t believe I haven’t done it before! I’m sure the hat will end up at the craft fair, but right now it’s serving its purpose: knitting as therapy. I wish you the best of luck for your craft show! It seems like you’ve got some great items to sell, and those flowers are the perfect addition to all of those items. I especially like the beanie that you made as a focus item. The yarn that you got for the project that you wanted to do is beautiful, I can’t wait to see the finished project! Tell me something, is a yarn bowl worth the purchase? I’ve been oogling them for awhile now but have been undecided, but with the holidays coming up it might be something I ask for, if they’re really that nifty. Thanks! I’m looking forward to the show! 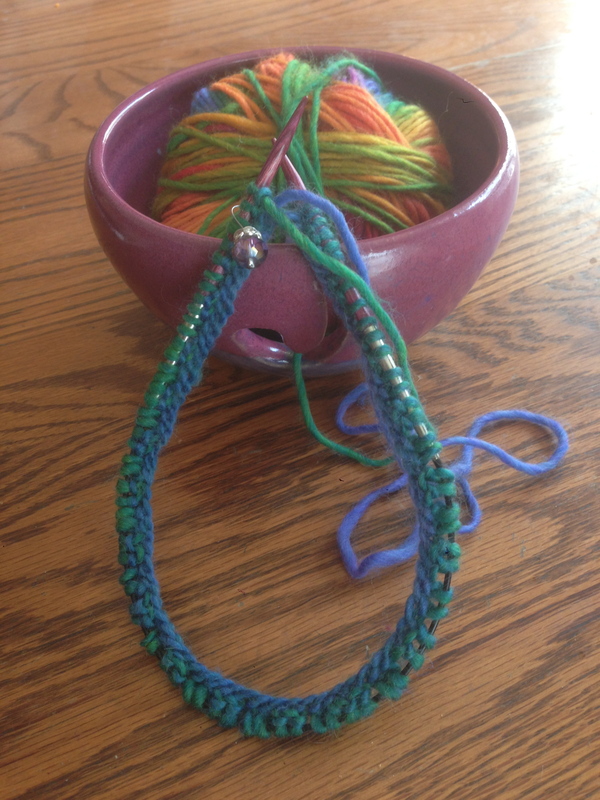 As for a yarn bowl, well…they’re really not necessary. I’ve gotten the same results from a plastic water cup with a lid that has a straw hole, and from a regular bowl with a binder clip on the side (just thread the yarn through the metal handle parts of the binder clip). But in general they’re awfully handy, much nicer than a loose ball rolling around. And I do enjoy having pretty yarny things sitting out. So I guess I’d say yes! They are that nifty! Everything looks great! You’re going to do so well. Best Wishes! Thanks! I think we will both have good juju that day!